Tikka rifles are rapidly earning a fine reputation for accuracy, quality and value with American hunters. Tikka rifles are manufactured in Finland by Sako. Both Sako and Tikka are owned by Beretta, giving them access to Beretta’s well-established and extensive dealer and distributor network. Newest members of the Tikka line are the T3 Hunter (wood stock) and T3 Lite (synthetic stock). The test sample on consignment was a T3 Lite Stainless in .270 WSM caliber. I compared it to a Tikka Whitetail Hunter (Stainless Synthetic) from my gun safe. Action differences are quite minor. The T3 has a smaller ejection port, with the integral grooves for scope rings running the full length of the receiver. Scope rings to fit the integral receiver grooves are included with each T3. ring from moving forward under recoil. Both use detachable, single-stack box magazines. The magazine locking latch is on the side of the rifle in the Whitetail Hunter, and on the front of the magazine in the T3 series. The T3 bolt knob is hollowed out while that on my Whitetail Hunter is solid. Otherwise the actions are similar. There’s plenty of steel in the thick, high side rails, making for a very rigid action. Bolts use twin forward locking lugs, a Sako-type hook extractor, and spring-loaded plunger ejector. Even though this is a two-lug action, bolt lift is a relatively short 70 degrees, leaving plenty of clearance between bolt handle and scope. 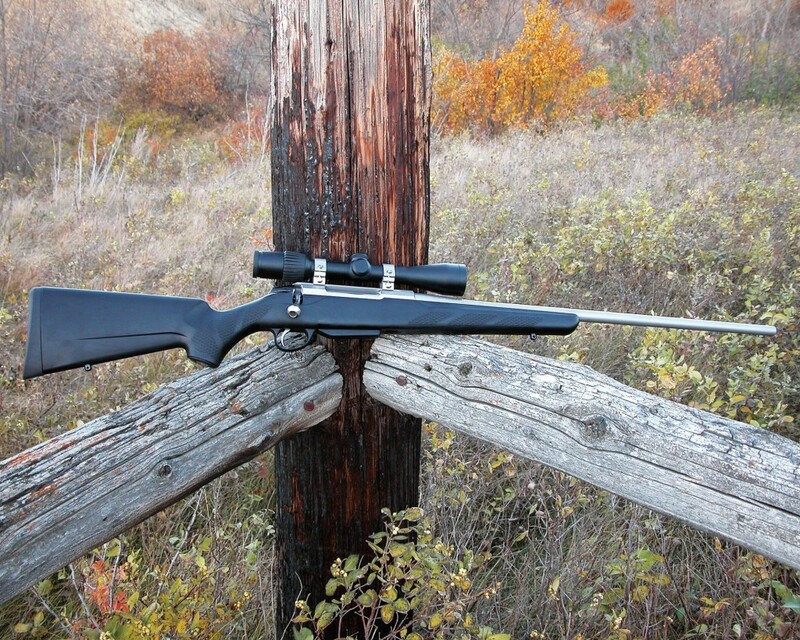 The T3 uses the same fine single-stage adjustable trigger as the Whitetail Hunter. The two-position safety locks sear and bolt handle. 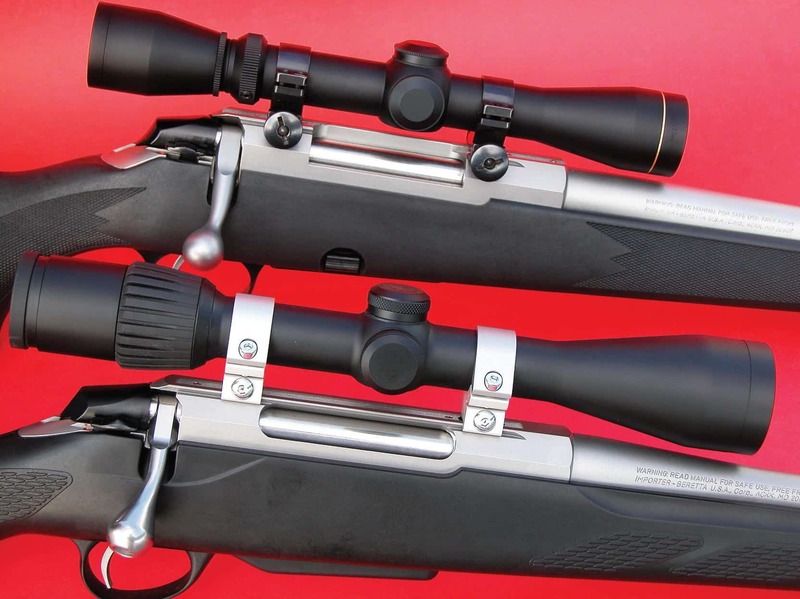 Both are fitted with hammer forged barrels, the same barrels as are used on the much more costly Sako rifles. Cost savings are achieved with the T3 by offering fewer options. The Whitetail Hunter is offered in both short and long actions, right or left hand versions, wood or laminated stocks. In addition there are Target, Varmint, and Long Range Hunter variations. All T3s are made on the same long action. T3s for short cartridges are fitted with a longer bolt stop so bolt throw is shorter. Currently the only options, other than cartridge choice, are wood with blued steel, or synthetic stock with stainless or blued steel. The recoil lug, a flat steel plate, fits snugly in a recess in the stock. When the barreled action is bolted into the stock, the recoil lug engages a slot cut in the bottom of the receiver. Manufacture is no doubt simpler and less costly than receivers with integral recoil lugs, or designs with the recoil lug sandwiched between barrel and receiver. The uncluttered, simple shape of the receiver makes it easy to machine to precise dimensions. It also makes it easy to manufacture the stock to similar dimensions, enhancing stock/receiver fit. The barrel is free-floating. I was pleasantly surprised by the lightweight synthetic stock. Unlike some lightweight, injection-molded stocks the T3’s stock is extremely rigid. With the barreled action removed, grasping the pistol grip and fore-arm and twisting hard, I could detect no movement at all in the stock. The stock is made of a very “hard” synthetic. There’s no need for pillars around the stock screws, as the hard stock material has no more give to it than steel. I was concerned it might be brittle, so I took a non-marring nylon mallet and gave the stock a few whacks in various places, with no effect. The stock is strong as well as hard. choice, weight of rifle and scope will run in the range of 6 3⁄4 to 7 1⁄4 pounds. Barrel lengths are 22 7⁄16 inches (57 cm.) in standard cartridges, 24 3⁄8 inches (62 cm.) in magnum cartridges. Smooth With A Capital "S"
I don’t know of a rifle currently being made which has a slicker, smoother working action than the Tikka. The newer short magnum cartridges don’t always feed well from Mauser-type, double-stack magazines. I’ve seen examples in which cartridges would sometimes bind when making the “turn” from beneath the left or right feed rail. The T3’s single stack magazine feeds short magnum cartridges straight into the chamber, smoothly and with complete reliability. The downside of the single-stack magazine is it takes up more space vertically than a double-stack magazine, projecting from the bottom of the rifle. I used the supplied rings to fit a Weaver Grand Slam 3-10x40mm scope. These rings clamp to the integral rails in the receiver. There is no notch or slot to prevent ring movement. I was a bit skeptical the rings would hold tightly enough to prevent creeping forward under recoil. So far, though, the rings have not moved during the firing of some 120 rounds of .270 WSM ammunition. If a shooter doesn’t like the supplied rings for any reason, Tikka solid steel Optilock™ rings and bases with polypropylene ring inserts fit the T3. The T3’s receiver is also drilled and tapped to accept other popular bases and rings. Especially in magnum cartridges this light rifle recoils briskly. In .270 WSM, depending on the load, recoil energy is approximately 32 ft.-lb., while recoil velocity is 16 feet per second. By comparison a 10-pound .375 H&H magnum has a recoil energy of approximately 35 ft.-lb, and recoil velocity of 15 fps. Winchester Supreme ammunition was used for accuracy testing, in loads with Ballistic Silvertip and Fail Safe bullets. Three-shot groups were fired at 100 yards; best group was .41", worst group 1.78", average of 15 three-shot groups was .92". Light rifles in relatively powerful cartridges aren't the easiest to shoot from the bench. With the good stock design and recoil pad the rifle isn't unpleasant to shoot, but it does move quite a bit in recoil so seemingly minor pressure differences in hold make quite a difference in point of impact. All of which excuses are meant to explain driver error probably played a part in group sizes. Subsequent range trips were used to test the qualities of the rifle from hunting positions, on steel targets at various ranges. The T3 balances and handles beautifully; light for fast handling, but with just enough muzzle weight to hold steadily. The crisp trigger, virtually free of creep and over-travel, certainly enhanced practical accuracy. From the box weight of pull was just under four pounds, and it can be easily adjusted to as low as two pounds. The slick bolt operation, short bolt lift and bolt throw and smooth in-line feeding made for fast follow-up shots. Functioning proved completely reliable. The only criticisms I can make are purely subjective. I don't care for detachable magazines. They have a way of getting separated from the rifle, especially as I get older and more forgetful. From an appearance aspect I wish the magazine didn't extend below the line of the stock, though I'm willing to pay that price in return for the smooth and reliable straight-line feeding. 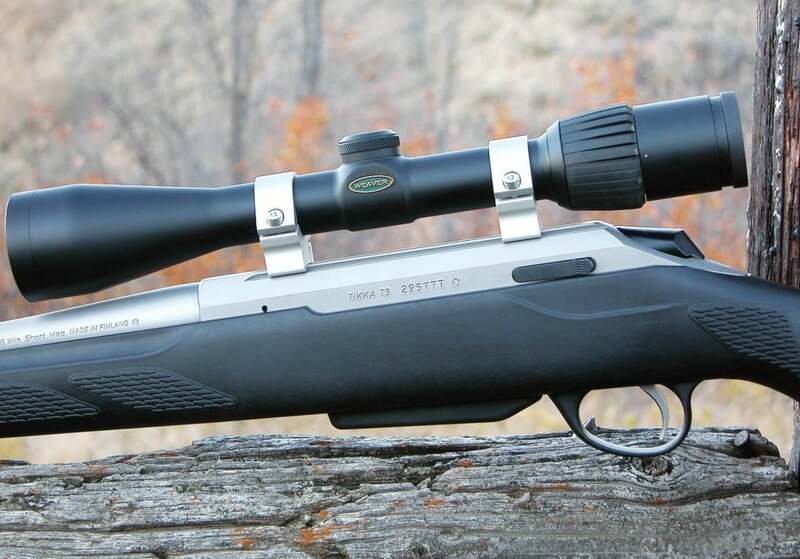 The T3 Lite Stainless is a fine example of the modern hunting rifle. For traditionalists who believe rifles should made of blued steel and figured walnut, these modern rifles can be a bit hard to accept. I tend to fall into the traditionalist category myself. But the T3 is so darned practical. Here we have a rifle that is light, tough, accurate, that handles and operates with speed and precision and is virtually impervious to the elements. 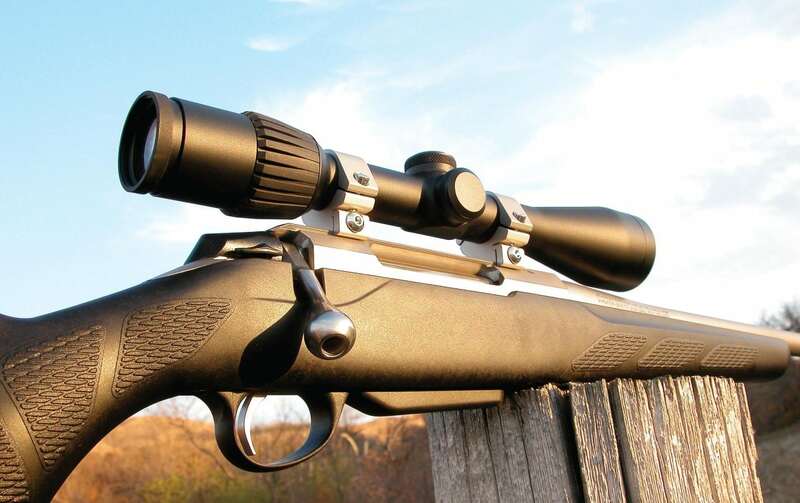 At a suggested retail price of $646 it is an outstanding value and an impressive rifle. Capacity: 3 1 (4 1in .223 Rem.) Plus 2 magazines available for all but WSM cartridges. Calibers: .223 Rem., .22-250 Rem., .243 Win., .308 Win., .25-'06 Rem., .270 Win., .30-'06 Sprg., 7mm Rem. Mag., .300 Win. Mag., .338 Win. Mag., .270 WSM, .300 WSM. Finishes: Synthetic/blued, synthetic/stainless or wood/blued Scope rings included. Reprinted with permission. Visit www.gunsmagazine.com to view this and other exciting gun articles. 6 Response to "Tikka T3 – By Dave Anderson"
I will look into this. We just launched this new site last week and are learning how to use everything ourselves. I’ll have an answer for you shortly. I purchased a Tikka T3 about eight years ago, maybe more. Never the less, loved it so much, so impressed, I now own 9 of them. Thats right, infected and addicted. Not one has ever had an issue with accduracy, durability and weather tough. From a 243 to my 300 WSM, accuracy is tops. The supplied rings are perfect, aroedynamic and fit perfect. No slips, no movement at all. I shoot and shoot often. At our 500 yard range, they still keep in the Deer kill box every shot unless I the shooter, screw it up. The triggers are perfect, no creep at all. The bolt is the smoothest I have ever felt. Just a absolutely beautiful rifle, sleek, slick and above all, ACCURATE. Some are wood and some are synthetic. The super lite fluted model, what a joy to carry for days on end. The Walnut stocks, wow, beautiful. Great gun. Can't beat it. Sorry yo bother you with such a trivial question. I am looking for a Tikka T3 ball cap, just plain black. Can you point me in any direction? I’ve searched all over, even called Beretta. No one so far can help. what factory load are you using for the 300 WSM. i've had mixed results and am looking for a good starting point. the rate of twist is different from most 300 WSM so i find the data online is questionable at best. any recommendation are appreciated! Just bought one. Little used second hand in perfect condition, about 10% more than the price you give. No sign of use and screws not marred. Syntheric stainless light, in .223 Remington. My first centrefire rifle after several rimfires. Seriel umber is 768177. Figure 8" on the barrel which I understsand is a 1 in 8 inch twist. When I saw the fast twist I thought it was too fast. Because I knew the .222 Remingron and Hornet was originally in 1 in 12 twist. I now hear that the fast twist is needed to stabilise long heavy bullets for long range and makes it more versitile. Fired 100 rounds of 50 and 55 grains through it and no keyholing with nice .22 rounds .22 holes at 100 and 150 meters, I passed over a CZ because I did not like the snapple thin foreend, but the stock shape on the Tikka is perfect to my liking, especially the stout forend. I am using an old 1 inch Nikko Sterling scope, until I get a new one, but I thnk I will buy a Tikka factory set of rings for it. In regard to mounts slipping, I hope to fit the forward mount ring well up to the end of the rails where there will be no room to slippage (any comments). I never fancied the 2 mm screw fitted mounts, but maybe that just me. Any way got 3 shots within 1 inch in high wind to day @ 100 yards and 3 withing 1.5 inches in high wind and rain at 150 yards. I was considering a .204 calibre, But was persuaded not too due to a possible scarcity of ammo. Its a good round too, but I now have my .223 and deligjhted. Lovely shape and modern looking. Foxes need seeing to here, they have the rabbit population decimated. I have a farm so can shoot an home to 300 yards for practice and calling foxes. I have had 4 rifles previously and I have to say there is nothing to equal the anticipation and excitment of taking possession of a new rifle.